Die lampe trug sie zu den Wasserlilien. dieweil nach Wasser und nach Lilien ich lechze. wo kein Verlangen eins vom andern trennt. Die Wand wird Spiegel uns des Sternenheers. klirren die Salzkristalle alten Leids. indessen ruhelos das Spukschiff segelt ? - Doch wenn Maria seufzt, fass stumm ich ihre Hand. in ihrem Wein der Blutgeschmack des Lammes. verdirbt der Wahn zu Schimmel an den Wänden. des Vogels, den wir traurig flattern lassen. sind wie nach einer Schlacht wir aufgebahrt. Marias Hand auf meinem grauen Haar. Aus: Maurice Gilliams: Gedichte, Antwerpen, Librairie des Arts,1965. She carried the lamp behind the water flags. as I long for water and for flags. where no desire tears one and the other asunder. The wall becomes mirror of the army of stars. grate the saline crystals of old sores. while the phantom ship incessantly sails on? - But when Maria sighs, I take her hand. their wine tastes of the lamb's blood. the illusion wastes into mildewy walls. of birds that one sadly must set free. as after a battle we lie on the bier. Maria's hand rests on my graying hair. nel loro vino c'è il sangue dell'agnello. l'illusione si guasta come una muffa sui muri. degli uccelletti che a malincuore liberiamo. siamo due morti dopo la battaglia. La mano di Maria sui miei capelli grigi. Elegie Fiamminghe Faenza: Mobydick, 1994.
v vinu je okus po krvi jagnjeta. zabloda zgnije in splesní na stenah. ptic, ki jih z žalostjo spustimo na plan. kakor po bitki, na mrtvaškem odru. Na mojih sivečih laseh Marijina dlan. When Maurice Gilliams (1900-1982) won the Grand Prize for Literature in 1980, many a newspaper journalist was at a loss: as far as the press was concerned Gilliams had always been ‘the Great Unknown’ of Dutch-language literature. But in the literary world itself Gilliams’s work was considered not only an inside tip but also a milestone in the development of the novelist’s art. In 1936 Gilliams’s Elias of het gevecht met de nachtegalen (Elias or the Struggle with the Nightingales) had ushered in a new, strongly suggestive way of writing and a novelistic structure based on the sonata. The critics called the book a ‘melting pot of genres’: Gilliams’s prose is close to poetry and driven by what he himself called ‘an essayistic motivation’. Gilliams has been a major influence for a number of Dutch and Flemish authors - amongst them Charlotte Mutsaers, Stefan Hertmans and Erwin Mortier, but his work remains unique in Dutch literature. His diaries, which were published in his lifetime, also reveal that Gilliams was one of the first writers in Flanders or the Netherlands to obsessively address the question ‘what is writing?’. 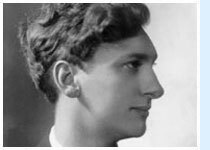 Poetry International Web presents poems of Maurice Gilliams in original and english translations and further information about the poet.